The soaring cost of food and transport left households £11 a week worse off last month than they were a year ago, according to a survey that reveals the erosion of family spending power. The average UK household had £166 a week of discretionary income to spend in July, according to the Asda Income Tracker – 6.4% lower than at the same time last year. Family budgets were squeezed after the cost of travelling increased by 16.5% year on year, according to figures from the AA motoring organisation, while food prices remained high despite food price inflation easing marginally. The Asda survey is likely to put pressure on the chancellor, who has come under fire from business groups and some of his own MPs to boost growth. Ed Balls, the shadow chancellor, said that George Osborne needed to act to stimulate the economy, which has failed to grow for almost a year. A forthcoming slew of business surveys will indicate the health of the construction and manufacturing industries. Separate figures from the British Bankers’ Association are expected to show that small businesses are struggling to persuade banks to release much-needed cash for investment. The rate of inflation as measured by the consumer prices index increased to 4.4% in July, from 4.2% in June, with conditions in the labour market also worsening. Osborne is known to believe that while a combination of wage freezes and inflation has eaten into family incomes, low interest rates have protected 12 million homeowners, who are paying mortgage rates far lower than before the 2008 banking crash. The Bank of England has signalled that rates will remain low for the rest of the year. Many analysts believe they will remain at 0.5% for much of 2012. The British Chambers of Commerce said over the weekend that the Bank of England should add to its support of the economy with a further round of quantitative easing (QE). The purchase of government bonds under the QE programme is designed to boost bank balance sheets and promote lending. Up to now, high-street banks have faced criticism for hoarding the proceeds of QE. 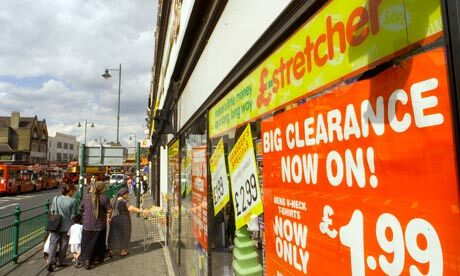 Andy Clarke, Asda’s chief executive, said that families were under pressure to restrict spending to essentials. “The maths is simple – the rising cost of feeding the family, getting around and increasing unemployment add up to the biggest squeeze on families since the last recession,” he said. The retailer found customers were trying to economise by half-filling petrol tanks and cutting their own hair instead of visiting hairdressers. July’s inflation figures from the Office for National Statistics showed that the cost of clothing and footwear went up by 3.1% year on year – the highest annual surge since records began in 1997. The cost of water, electricity and gas increased by 4.6% on an annual basis, the highest increase in two years. British Gas, E.ON, npower, ScottishPower and Scottish and Southern Energy have all unveiled price increases in the past few weeks. The pressure on commuters’ budgets will further increase when rail fares rise by an average of 8% from January.